Support > Frequently Asked Questions > Do you have screen shots of ‘typical’ touch screen control panels or user examples? Do you have screen shots of ‘typical’ touch screen control panels or user examples? See 29 touch screen control panel interface designs using Reach modules in this 1:34 minute video. Here are some still screen shots of touch screen control panel customer examples. 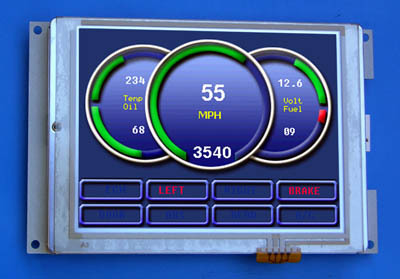 Chetco Digital uses 5.7″ QVGA touch screen control panels to create the display below. See several other screenshots. Chetco Digital makes an analog to digital instrumentation hub, enabling a touch screen gauge interface, remote switching, engine data logging, and SeaSmart.NET NMEA 2000 compatible wireless networking for marine, automotive, and industrial applications. Industrial Ventialcaiton, Inc. makes Centurion, a stand-alone control unit that easily and precisely manages storage climates by controlling fans, evaporative coolers, heaters, refrigeration, humidification, Co2, and fresh air. It uses a Reach 5.7″ display module. Sciton uses an 8.4″ display module in JOULE which offers an unprecedented array of laser and light wavelengths through any of its three distinct delivery modes: arm, fiber, and broadband light. As a result, JOULE allows practitioners the maximum versatility to provide the widest range of aesthetic and surgical procedures available from a single platform.